You will be amazed at the diverse nature of Curacao attractions once you arrive on this picturesque island. Curacao boasts something for everyone whether you are young or old, single or with a group and families will like the varied choices of activities. You can participate in such stellar activities like scuba diving or snorkeling at a submerged tugboat or just relax on one of the islands white sand beaches. Other fascinating excursions you can take include hiking in Christoffel National Park or shopping on Mambo Beach for that special souvenir. The Dutch-Colonial architecture in Curacao is one-of-a-kind in the world with brightly painted homes in Willemstad to the engineering feat of the Queen Juliana Bridge which is the longest bridge in the Caribbean. Families will enjoy a trip to the Flamingo Sanctuary, the Curacao Ostrich Farm and the Curacao Sea Aquarium is a world-class facility. 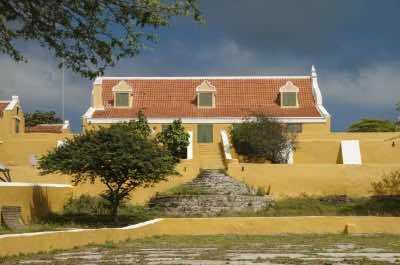 Culture and history cannot be missed with several museums like the Kura Hulanda and Savonet which explain the unique aspects of the Curacao people. No matter what excursion you choose, you can look forward to an entertaining time while visiting the best Curacao points of interest. 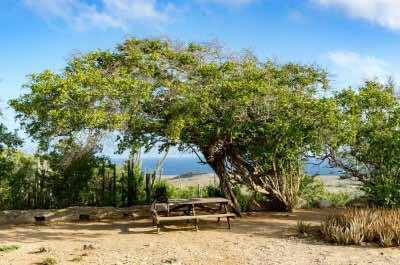 If a scenic hiking tour grabs your fancy, then the Shete Boka National Park is a great Curacao attraction. Spend time absorbing this stunning landscape from high up on the cliffs, where you will get views of wild waves crashing against the rocky coastline. Venture down to the water and find secluded beaches hidden away between high rocky outcrops, where the famous sea turtles lay their eggs. Set off to Boka Tabla, an undersea cavern. See the awesome Boka Pistol, a natural water canon. Try out the jacuzzi and the bathtubs all formed naturally by the water. End your day at the Boka Tabla Cave, a magnificent sight, created by wild waters washing away the limestone rocks. 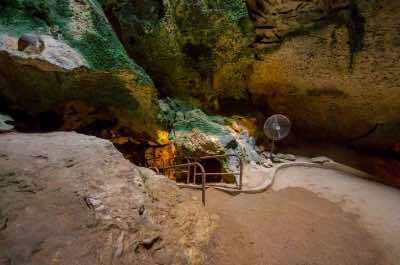 Cave lovers will be thrilled to know that they can explore another great Curacao attraction - Hato Caves. The limestone Hato Caves were formed 200,000 years ago and are famous for their magnificent stalactites and stalagmite formations. Be awed as your guide tells you about the Arawak tribe who originally lived in the Hato Caves - one of the most fun Curacao points of interest. The wall paintings they did still remain to this day and are over 1500 years old. In the later years of colonialism, runaway slaves would hide in these caverns, hoping to escape. The cave is filled with long-nosed fruit bats so take note! A dramatic display of lighting has been created to showcase the beautiful waterfalls and pools. This trip is suitable for all ages and levels of fitness. 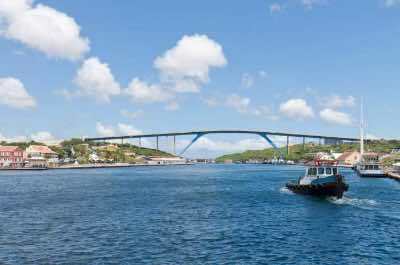 Another fascinating attraction in Curacao you must see is the longest bridge in the Caribbean. 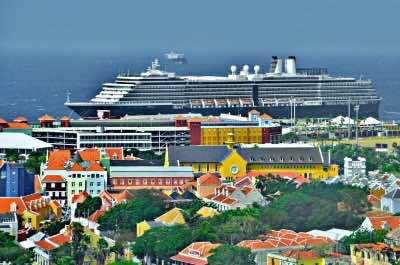 The bridge is called Queen Juliana and spans St Anna Bay in Willemstad, the capital city. This amazing construction is over 1600 feet long and 180 feet tall. It offers a stunning minimalist design and supports four lanes of traffic. The bridge you see today is a new structure, opened in 1974, which replaced the original bridge which collapsed in 1967. The most amazing views are seen from the bridge, stretching across the Schottegat, Punda and Otrobanda. Stand and be awed as huge ships pass beneath you! Then visit at night for even more panoramic views of the Island lights. 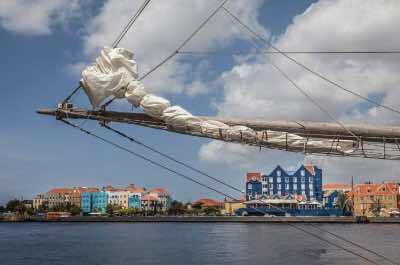 Willemstad is the capital city of Curacao and has been a major port for many centuries. This is the most likely place you will arrive at if you come by sea. 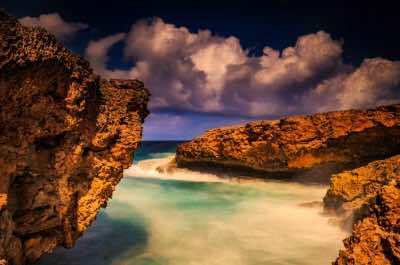 If not, take some time to explore this popular Curacao attraction. Historians will be enchanted by the influences the Dutch, Portuguese and French sailors left as their mark. See the colourful old warehouses and shipping yards located next to the water. Watch the huge cruise ships arrive and depart. There is a floating pedestrian bridge that makes for a great walk. The Cruise Port is within walking distance of the Queen Emma Bridge which will take you into the main shopping areas of the city. 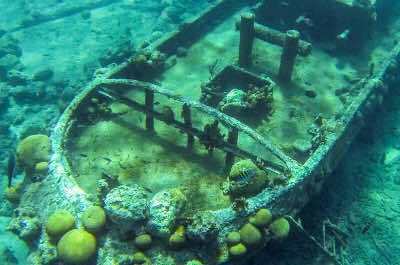 The Tugboat Wreck near Caracas Bay, is the island's famous dive place and a popular Curacao attraction, that lies only 15 feet deep under the water and can easily be reached from the shore. The boat sank accidentally years ago and due to its shallow position, can be seen by both swimmers on the surface of the water and by those who wish to snorkel or dive deeper. The wreck is in good condition and intact, lying upright and has become home to a myriad of fish, colourful marine creatures, sponges and corals. If you dive down, you will find that the reef drops away into a steep wall, offering the brave a thrilling look into the murky depths. Nature lovers must spend a day at the Christoffel National Park, another fabulous tourist attraction in Curacao. The Park is a protected nature reserve and offers the opportunity to explore a number of hiking trails depending on your level of fitness. Start with the easiest, which is a slow 20 minute walk ideal for the whole family. See the famous and rare white-tailed deer, stunning wild orchids and the native barn owl. Then take a tour of the historic Plantation Savonet which also lies within the grounds of the Park. For the more adventurous, set off early and hike to the top of Mount Christoffel where you will rewarded with panoramic views over the Park. If you have never fed an ostrich, then this it's about time you do! 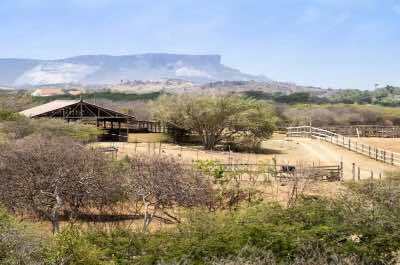 The Ostrich farm is a favourite Curacao attraction with tourists, being home to over 400 birds and many newborn chicks. The farm was opened in 1995, and was originally a working farm, supplying ostrich products to South America. Take a safari-type tour in an open truck and learn about these amazing creatures from your knowledgeable guide. See the massive eggs and get involved in feeding the chicks and the adults. As you travel, look out for emus, Nile crocodiles and potbellied pigs who also live here. For dinner try an ostrich steak or burger, it is quite delicious! When in Willemstad, another must-visit Curacao attraction is the Sea Aquarium. The Aquarium is located inside an old navy vessel and offers a unique and different marine adventure. When you get on board, you will be delighted to observe stingrays, sharks, huge turtles and rockfish. The dolphin and seal shows will delight the kids. The aquarium also offers natural lagoons where you can swim with stingrays and dolphins and feed them under supervision provided by the staff. The brave can feed the nurse sharks, by pushing food through special small tubes in the glass wall and waiting for the sharks to swim up to you! 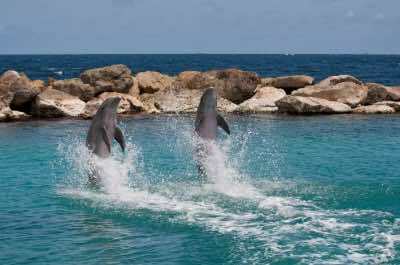 If you dream about swimming with the dolphins, then this is a wonderful Curacao attraction you must visit. 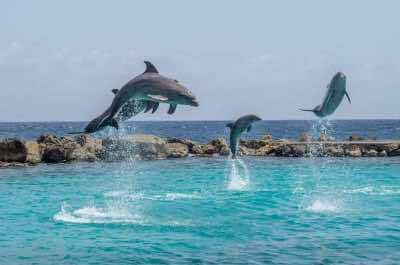 The Dolphin Academy is located at the Sea Aquarium and offers a chance to learn about and interact with these amazing creatures. The Academy specialises as an educational and fun experience and is home to twenty Coastal Bottlenose Dolphins. Each one has a name, and Copan, Bonny and DeeDee and are waiting to meet you! Swim with the dolphins and feed them, or dive down deeper if you are more experienced. The guides have years of knowledge and will look after you at all times. Visits are limited to smaller numbers of people, so your experience is maximised to provide memories to last for a lifetime. 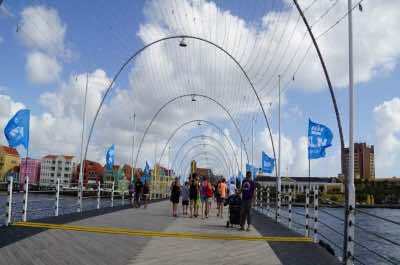 Queen Emma Bridge is another fun Curacao attraction you can't miss. This famous structure is a pontoon bridge that floats and connects the two waterfronts of Otrobanda and Punda. Be amazed when you see the bridge moving across the bay and lining up parallel to the shore line so the huge ships can pass through the Bay. The bridge was built in 1888 and is for pedestrians only. Walk across and take some fabulous pictures. Quaint cafés and restaurants are located on the waterfront on both ends, stop for a traditional meal and beverage. Visit the Bridge at night too, it is a vibey and trendy spot for eating, drinking and people watching. 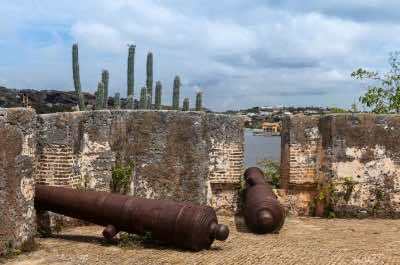 Historians love old forts with a story to tell and Fort Beekenburg is a fascinating Curacao attraction for history aficionados. The Fort stands as an imposing monument on a high rocky cliff at the south end of the Island. It was built in the 1700's and was used to repel invaders who attempted to land in Caracas Bay from the seaward side. Access is free and you can take time to explore this now abandoned fortress. Climb up to the very top where you will find the original old cannons and also have great views over the land and ocean. The climb is fairly strenuous with stairs and ladders and may not be suitable for all. The historic downtown district of Punda is a highly popular attraction in Curacao. This area features lovely pastel-coloured buildings set on the waterfront, offering a myriad of quaint stores, art galleries and restaurants to be explored. The name means 'Point' as it is located at the mouth of St Anna Bay. Reminders of Dutch colonialism is seen in the architecture and will thrill historians. Visit Fort Amsterdam, a garrison built in 1635 to protect the city. Then stroll to the Mikve Israel-Emanuel synagogue. It was built in 1732 and is the oldest synagogue in the western hemisphere. Take a walk across the Queen Emma Bridge, return and settle down to a delicious traditional Island meal. Exploring the 'Other Side' or Otrobanda should also be on your list of activities in Curacao. 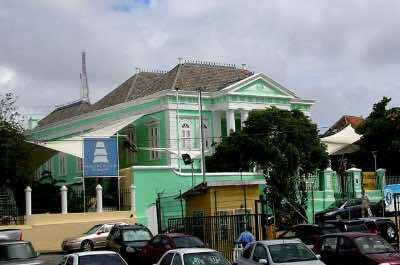 This downtown area lies across St Anna Bay, opposite the Punda area. 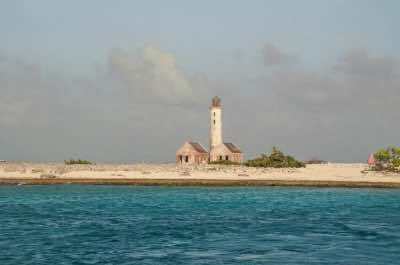 It is known for its historic ambiance and offers a great view of Punda from over the water. See the main attraction, the Riff Fort, which was built in 1828 to defend the city from attacks. It is now a shopping mall where you will find fine-dining restaurants and quirky little stores selling souvenirs. Stop in at the Curacao Museum, which showcases the works of local artists, It also has an interesting collection of antique furniture. Airplane enthusiasts will be thrilled to see the cockpit of the SNIP. This plane belonging to the KLM Airline, was the first plane to fly from Holland to Curacao. 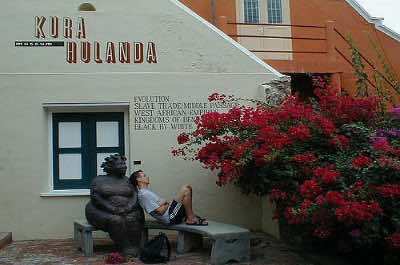 Kura Hulanda Museum may be a sad but eye-opening Curacao attraction. It offers a rare and moving insight into the lives of the slaves and the horrors they experienced. It also has one of the most comprehensive collections of Cultures of Curacao and features a world-class chronicle of the Origin of Man. It is situated on the site of a former slave yard, adding to the atmosphere. The Museum is massive and will take time to explore. Get your printed guide at the reception and set off. Plan for some light hearted fun afterwards as this may be taxing! Handelskade pier is a picturesque Curacao attraction you are probably familiar with from the pictres of Curacao. 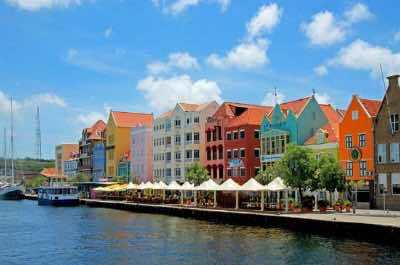 The setting, located on the Punda side of Willemstad, offers lovely pink-painted Dutch colonial buildings along the waterfront. Wander around and soak up the atmosphere. Stop at a quaint outdoor café and watch the Queen Emma Bridge swing open to let the ships pass through. Be awed at the daily floating market where you can bargain for fresh fish and local produce, make sure you arrive early! This picture-postcard venue is stunning both during the day and at night. Take your camera and get going! Klein Curacao is an exciting attraction for the adventurous person who is seeking a pristine landscape and a fun boat ride. Located off the southeast coastline of Curacao, Klein Curacao is also known as Little Curacao and is an uninhabited island. You will thoroughly enjoy Klein Curacao on that features a gorgeous white sand beach, an old lighthouse and just a few scattered beach huts. Klein Curacao has a fascinating history from the slave trade to mining phosphate with the scars of industry being carved over by nature. You can enjoy excellent snorkeling and scuba diving off the shores of Klein Curacao which includes numerous underwater caves and beautiful coral reefs which are teeming with brightly colored marine life. Savonet Museum is a special Curacao attraction that will take you from the island’s early history to present day in an easy accessible format. Located in the northern portion of the island within Christoffelpark, the Savonet Museum will give you a great understanding of the plantation island life. The Savonet Museum is housed within the old Savonet Plantation and incorporates many multimedia and interpretive exhibits into the landscape of the buildings. You can view information on the early Arawak Indians up to present–day Curacao as well as look at many interesting artifacts such as slave tools, historic photographs and plenty of antiques. Another plus about visiting the Savonet Museum is that Christoffelpark is the largest nature reserve on the island. You can combine an exciting land and beach safari excursion with your trip to Savonet Museum. 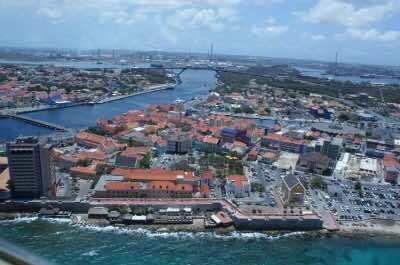 Riffort Village is an excellent choice for a Curacao attraction that combines the best shopping, sightseeing and dining options in Willemstad. Located in Otrabanda on the western coastline of the island along St. Ann Bay, Riffort Village has a great atmosphere and be accessed by walking over the Queen Emma pontoon bridge. While you are at Riffort Village you can walk through Rif Fort which was constructed in the 19th century is a UNESCO World Heritage Site and combines great history with architecture as well as 56 canons. If you feel energetic you can also climb to the top of the Fort, to see the old cannons and the view. 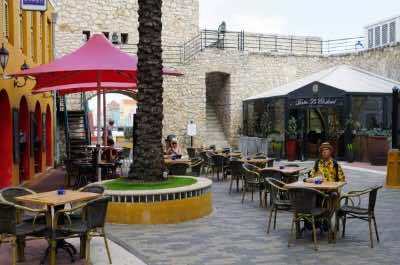 Today you will be amazed at the shopping that is now housed within the older Rif Fort buildings and you can browse iconic shops such as Tiffany and Company for that perfect one-of-a-kind souvenir. Dining options at Riffort Village include Bistro Le Clochard for French dishes and Kandela Cigar Lounge which features entertainment as well as innovative Latin cuisine. 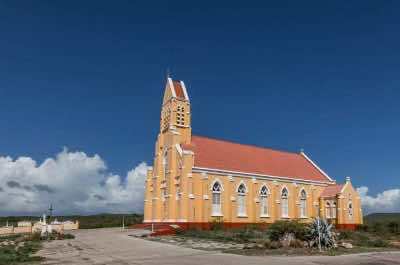 The Mikve Israel-Emanuel Synagogue is one of the more popular Curacao attractions for you to visit in Willemstad. Located in the Punda neighborhood, the Mikve Israel-Emanuel Synagogue is the oldest known synagogue in the Americas. Constructed in 1730, the Mikve Israel-Emanuel Synagogue is a fantastic Dutch Colonial style building with ornate craftsmanship throughout. Once inside you can walk through the interior of the synagogue which has high vaulted ceilings, superb woodwork and interesting chandeliers. The Mikve Israel-Emanuel Synagogue has a museum where you can view artifacts and learn the struggles related to the early Jewish settlers on Curacao. The gift shop at Mivke Israel-Emanuel Synagogue is a great place to purchase specific gifts related to the island and the Jewish faith. Another interesting spot in the Mivke Israel-Emanuel Synagogue is an area where you can look at a collection of marvelous tombstone replicas which were from the Beit Chaim Bleinheim which is the oldest Jewish cemetery in the Western Hemisphere. Mambo Beach Boulevard is the perfect Curacao attraction for you when you want to shop, dine and relax on a white sand beach. Located just north of the Curacao Sea Aquarium, Mambo Beach Boulevard has everything to keep you occupied for the whole day. When you visit Mambo Beach Boulevard you can enjoy browsing the several shops which include Bro Men’s and Siss Fashion for clothing, Out of the Blue for souvenirs and AHAV for jewelry. You can relax on the white sand Madero Beach and Mambo Beach where you can also swim, play volleyball or take a dip in the Mambo Beach freshwater swimming pool. While you are at Mambo Beach Boulevard you can indulge in exquisite cuisine at over fifteen different restaurants which include Fuoco Italian Chophouse, the Madero Ocean Club and Café 408. No matter what you are seeking to do for the day, you can combine them all with a visit to Mambo Beach Boulevard. 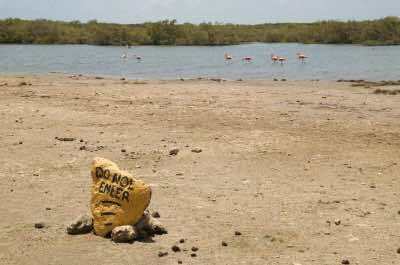 The Flamingo Sanctuary is a great Curacao attraction to view interesting wildlife in a natural landscape. Located near the village of Sint Willibrordus, the Flamingo Sanctuary is situated on an old salt flat which manufactured salt. The Flamingo Sanctuary allows you to view some of the world’s most colorful birds, the Flamingo. The Flamingo Sanctuary attracts numerous Flamingos on a daily basis and you can snap several photographs without bothering the birds. You can also hike several trails that are within this attraction including one that will take you to the top of Michielsberg which is a great spot to view the surrounding landscape of the Flamingo Sanctuary. A trip to the Flamingo Sanctuary can be combined with a tour of Sint Willisbrordus and you can also top at Playa Porto Marie for fun in the sun. Sint Willibrordus is a quaint community that is an ideal Curacao attraction for you to visit, view and learn more about the history of the island. Located on the western portion of the island northwest of Bull Bay, Sint Willibrordus is a small community which has lots of charm. There are several impressive sights within Sint Willibrordus which include a Neo-Gothic Roman Catholic Church which was constructed in 1888, a Flamingo sanctuary and a natural rock formation named El Indjan. Another interested stop while in Sint Willibrordus is to go snorkeling at Porto Marie Bay and Daaibooibaai where you will explore exciting marine life. Sint Willibrordus is a great choice for you when you want to escape the crowds of Willemstad and explore the countryside. You will thoroughly enjoy the learning experience when you visit the Maritime Museum Curacao. Located on North van den Brandhofstraat in Willemstad, the Maritime Museum is perfect for families. 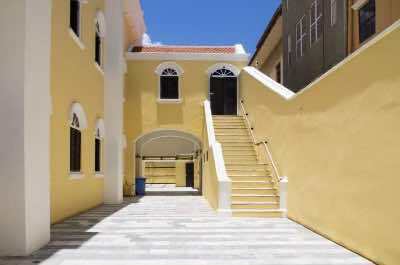 The Maritime Museum Curacao is home to an extensive collection of artifacts from the most historically significant time periods of Curacao that range from the Arawak Amerindians to the Spanish conquest to the early days of the slave trade and the development of the Dutch West India Company. The Maritime Museum Curacao combines excellent interpretive and multimedia exhibits to explain the story of Curacao that developed on land and sea. While you visit the Maritime Museum Curacao you can view exciting exhibits from a miniature refinery to excellent maritime artifacts like nautical charts, navigation equipment and model ships from 500 years ago to present-day. If you have some extra time, you can include a unique tour of the harbor on an original ferry while visiting the Maritime Museum Curacao. Landhuis Chobolobo is a unique Curacao attraction that combines the history of Curacao most famous distilled spirits while you watch the actual manufacturing process of this delightful beverage. 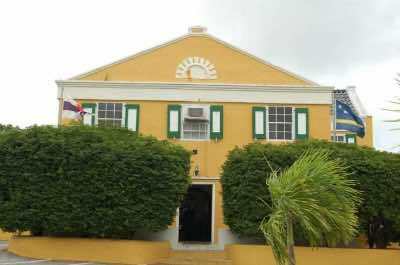 Located in Salina within Willemstad on Schottegatweg Oost, Landhuis Chobolobo is great for all travelers including families. Once inside Landhuis Chobolobo you will learn the interesting history of Curacao as you view an assortment of interpretive and multimedia exhibits. While at Lanhuis Chobolobo you will view the manufacturing process of this famous triple sec-style liqueur which is distilled in several flavors from orange to melon to coffee. You will be able to sample several of these fine liqueurs on your 45-minute tour of the facility. After you view the distilling process you should stop by the gift shop and/or the onsite bar where you can try a spectacular Cosmopolitan made with the original Landhuis Chobolobo liqueur. The Queen Wilhelmina Bridge is a fascinating Curacao attraction and the best Curacao point of interest that allows you an easy walking option to view the incredible architecture of Willemstad. Originally constructed in 1928 and named after the Dutch Queen Wilhelmina, this Curacao attraction is unique and worth the view. The history of Queen Wilhelmina Bridge which was built to connect the commercial areas of Punda to the historic neighborhood of Scharloo will amaze your senses. 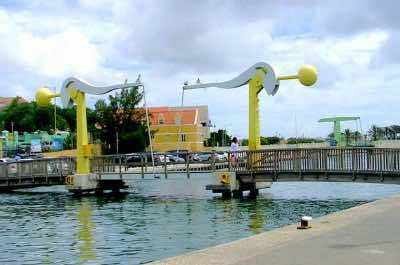 You will have plenty of photographs opportunities while you cross over this converted draw bridge which allows small boats and yachts to enter the numerous waterways of Willemstad. The history and scenery of Queen Wilhelmina Bridge is ideal for families and adventurers. The Queen Wilhelmina Bridge is a great option to include a dining stop with many fine restaurants like Plaza Bieu which specializes in local Creole cuisine and the Wine Cellar serves eclectic French dishes.